Breathing, panting, urinating, defecating and water evaporating through the paws all cause your dog to lose water. Under normal circumstances, he makes up for the loss by eating and drinking. However, when normal activities cannot make up for water loss, dehydration occurs. 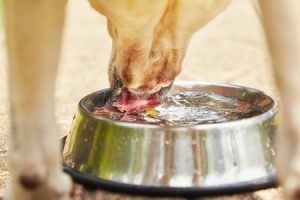 Your dog can get dehydrated when she has diarrhea or vomiting. It can also happen when the weather is hot or when water is not easily available. In serious cases, dehydration leads to organ and kidney failure. Puppies are more susceptible to dehydration than adult dogs because they have less body mass. Pay attention to the symptoms of dehydration in puppies, which include lethargy, sunken eyes, sticky gums and tongue, excessive panting, loss of appetite, depression and tented skin (skin that doesn’t snap back quickly when pulled). If you spot signs of severe dehydration, take your pup to the vet immediately. You can prevent dehydration by making sure your puppy always has fresh water available. When it’s hot outside, don’t let your puppy spend extended periods in the sun. When it’s cold, check to ensure that the water bowl isn’t frozen. Now that you’ve learned more about how to spot and prevent dehydration in puppies, you might be feeling ready to take home a sweet pup of your own. Come meet the adorable puppies and toy breeds available at Pauley’s Pups. Contact us at 804-798-7877 to learn more about finding your new best friend.